Our story can be traced back to 1922, when the coastal railroad (offici­ally known as the West Coast Line) was opened to traffic. The movement of goods between north and south brought prosperity to cities and towns along the rail line. Since the construction of the freeways, goods have been transported by highway instead of by rail, and the coast is no longer as affluent. 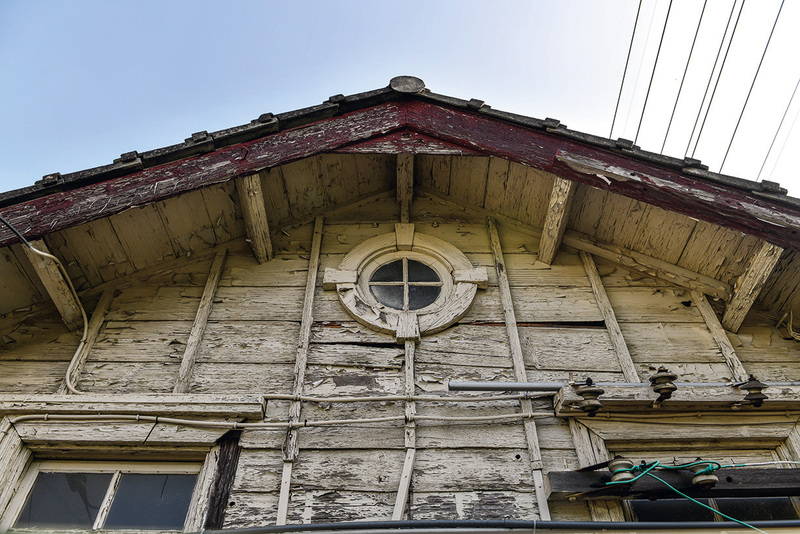 But train cars still run today between the rice fields and the waves, and the few remaining wooden train stations, nearly 100 years old, have become precious spaces for memories of railroad culture. Yet the scenery along the ­Miaoli coast is not limited to train stations. There is also Gong Tian Temple in Bai­sha­tun, dedicated to the goddess Mazu, as well as the “Say Hi Home” workshop for young people returning to their hometown. There is beautiful scenery all the way. 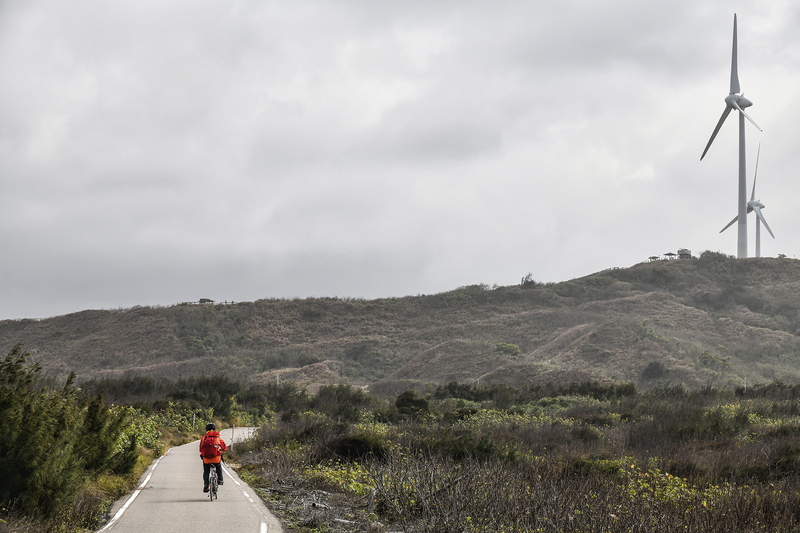 Following the route of the coastal line, with the speed and freedom of bicycles, we ride along Provincial Highway 61 in search of stories of the ­Miaoli seacoast. The coastal rail line and the older “mountain line” (the Tai­chung Line) provide the most captivating scenery of any of the railroads of the Taiwan Railways Administration. 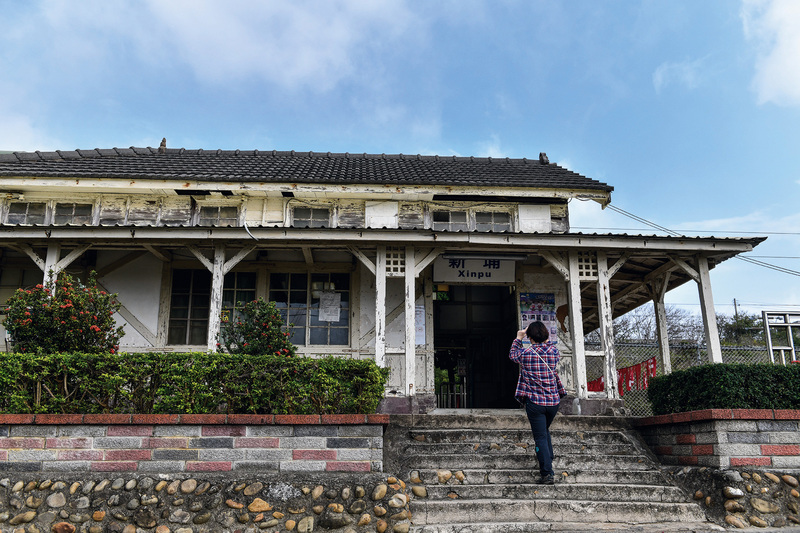 Of the five Japanese-style wooden train stations along the West Coast Line (known to railway enthusiasts as the “five treasures of the coastal line”), three—Tan­wen, Da­shan, and ­Xinpu—are located in ­Miaoli County. We start our bicycle journey at Tan­wen Station, and our path carries us to the Da­shan and ­Xinpu stations. These stations, of simple and unsophisticated design, were first used in 1922, so by now they have nearly 100 years of history behind them. Constructed of Cunninghamia wood, the buildings have a variety of common features, including pitched roofs, branching pillars, œil-de-bœuf (“ox-eye”) windows, and rammed-earth walls. 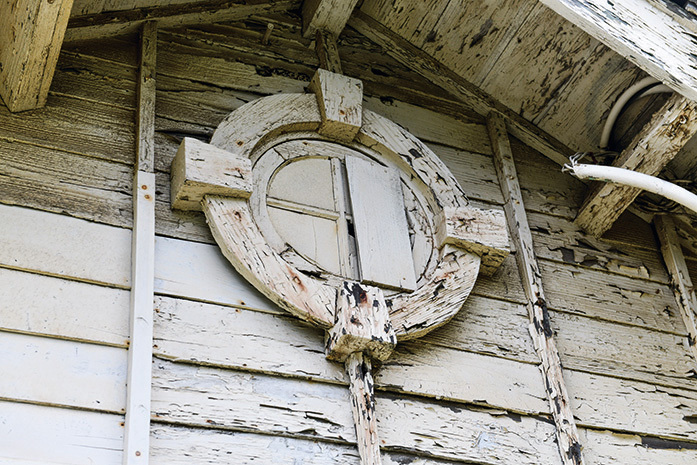 Though development around West Coast Line stations stagnated because of the decline in rail traffic, this cloud has a silver lining: It has enabled the stations’ original appearance to be preserved, as historical structures that testify to the line’s past. We continue our journey along Provincial Highway 61. Rail fans have told us of two can’t-miss sights for photo­graphy along this route. 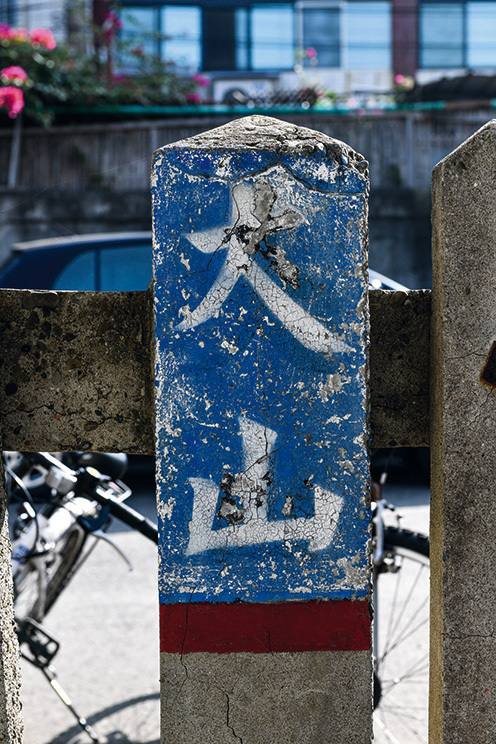 At the highway’s 106.3 kilo­meter mark, a side road leads down to the mouth of the Xihu River. 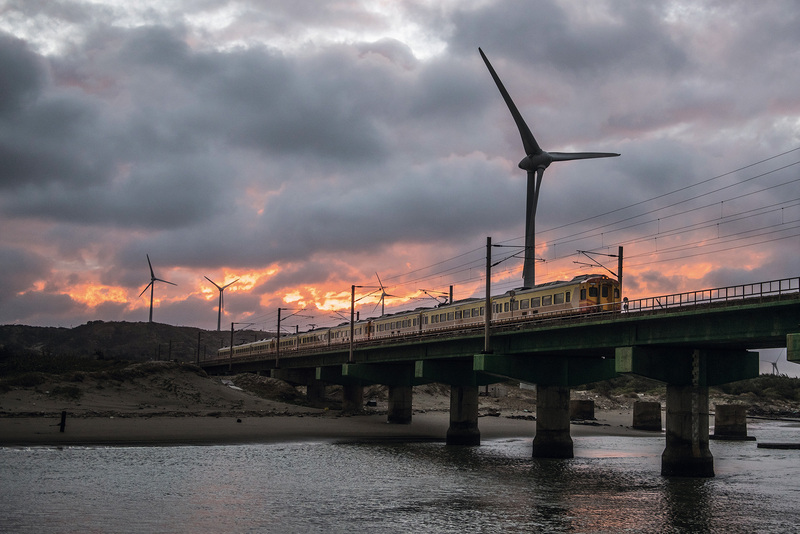 From there you can get a shot of wind turbines, trains, and ocean waves together in one frame, and when evening comes you can add the setting sun into the picture. To reach the next scenic spot, we have to work hard riding up Miaoli County Road 33 to the commanding height of Hao­wang­jiao, from where you can see the deep blue Taiwan Strait in the distance, the gigantic wind turbines along the coast, and a panoramic view of the coastline. In the strong wind, we wait for a train to come coursing through the verdant land, so that we can capture its image. Only then do we contentedly pack up our cameras. Another sight worth exploring is the nearby Old Guogang Tunnel—in fact a sequence of three tunnels. When the West Coast line was electrified in the 1970s, its route was altered to avoid the tunnels, which were abandoned. 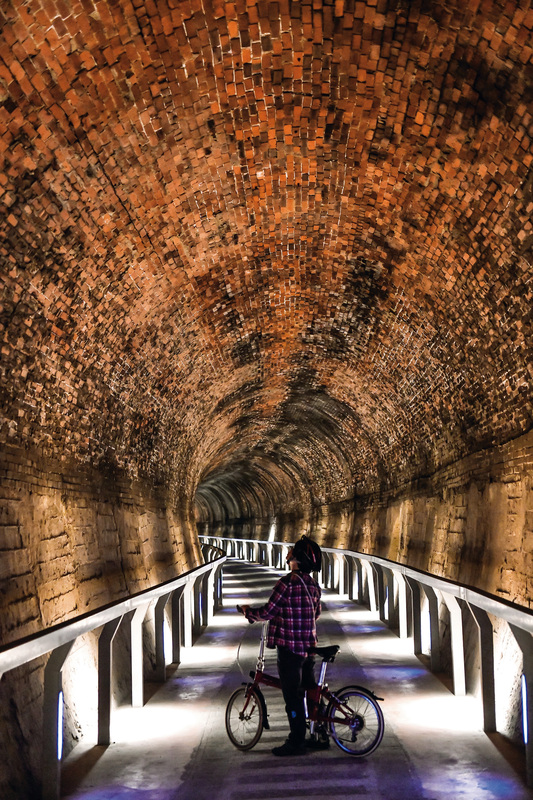 Today the old route, complete with the beautiful horseshoe-­shaped brick-lined tunnels, has been transformed into a bicycle trail with colorful lighting. 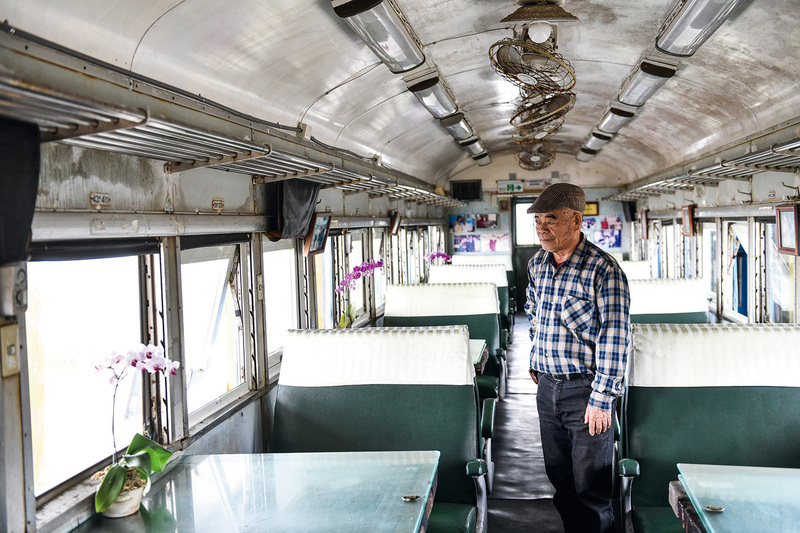 Leaving Highway 61 to follow a small road near the sea we come to the Shi­lian Yuan railcar restaurant. Shi­lian Yuan, now in its 17th year, is a special sight along the coastal line. Retired railroad cars have been repurposed as spaces to operate a restaurant and a homestay. Owner Luo Shi­lian, whose home is in nearby Bai­sha­tun, tested into the Taiwan Railways Administration in 1970. He witnessed the days when steam trains ran along the rail lines, and each day he rode the trains to work and back, working at the TRA for 33 years. First Luo bought five 30-ton railway carriages at the price of scrap metal, NT$1.2 per kilogram. Little did he expect that the transportation costs would amount to NT$1 million, it taking two nights to transport the cars by truck from Kao­hsiung to ­Miaoli. Because of the carriages’ height and length, they could only travel on ordinary roads, and only at night. Wherever the convoy would traverse a railway level crossing, they had to apply for the electricity to be shut off and the power lines raised so that the trucks could pass through. Finally Luo had to hire two 50-ton cranes to lift the cars onto the rails laid down for them at the site. Since its opening, the railroad restaurant has attracted numerous travelers. This place, where you can gaze out over the ocean and admire the sunset at dusk, really does offer “front-row” views of the sea. When you visit the Miaoli coast, you shouldn’t miss the local center of faith: Gong Tian Temple in Bai­sha­tun. Each year at Mazu’s birthday, in the third lunar month, the faithful come from all over Taiwan to walk alongside the goddess on her procession to Chao-Tian Temple in Bei­gang, Yun­lin County, and back to Bai­sha­tun. The journey covers more than 400 kilometers and has no fixed itinerary, with the twists and turns along the way all being decided according to Mazu’s will. This tradition exists because, as Gong Tian Temple committee member Lin ­Xingfu explains, “Bai­sha­tun sticks to the old ways, so much so that it has become distinctive.” In earlier times many temples had the tradition of people coming to them on foot to worship, but with changing times, others have gone over to allowing worshippers to arrive by tour bus, with only Bai­sha­tun still insisting that people approach Mazu on foot. And each time that Mazu goes out on her meandering trail, this provides a chance for the goddess to connect with local residents. The Bai­sha­tun Mazu takes the initiative to seek out believers, and as a result each “inspection tour” she makes gives rise to many moving stories of believers’ experiences of her. 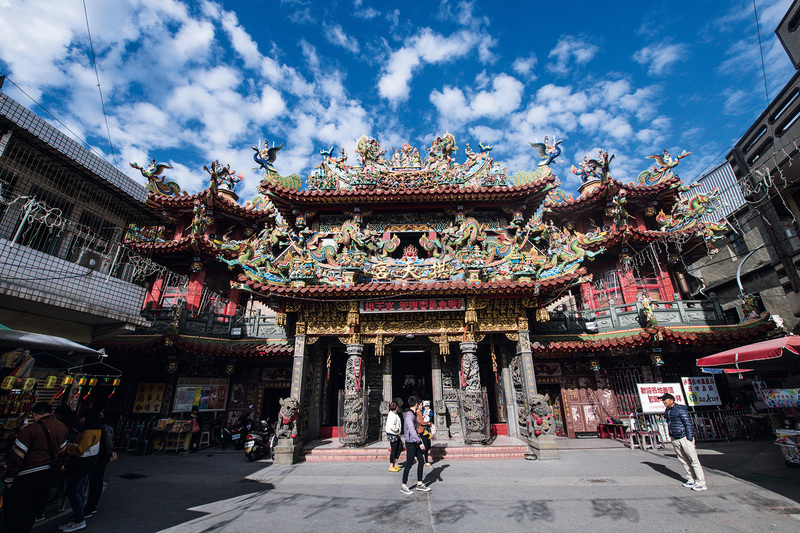 There are also various colorful stories surrounding the Gong Tian Temple Mazu herself. From the mouths of local elders one hears tales of the wrong Mazu statue being brought back to Bai­sha­tun, or of the deity’s palanquin being carried through the waters of the Zhuo­shui River at her own behest. “Folk beliefs reflect local people’s way of life,” says Lin ­Xingfu. He explains these stories from another angle—that they reveal a dependence on Mazu. The lives of Bai­sha­tun’s early settlers were not easy. Having to cope with the powerful northeast monsoon winds that blow daily in the fall and winter, as well as the vag­aries of life in a harsh environment, deepened residents’ reliance on Mazu. “People had to face uncertainties in life every day, and there are still threads of this in the worship of the Bai­sha­tun Mazu today,” says Lin. In fact, winter is a somewhat inopportune time for our bicycle trip. Although this winter has been warm, the northeasterly winds along the Miaoli coast are as ­powerful as ever, leaving us dizzy and making it hard even to stand upright. Lin laughs as he says that we chose the wrong time to come here. But we are having a genuine local experience, which lets us know that life here is not easy. The climate has shaped the indomitable character of the people of Bai­sha­tun, says Lin. Lin’s remarks are like sociological observations, and they seem to confirm that culture is the result of how people adapt to their environ­ment to survive. This was one of the unanticipated points of interest of our journey. Continuing southward we arrive at ­Yuanli, ­Miaoli’s southern­most township and the last stop on our trip. Turning onto Xin­xing Road, the place we want to visit is the Hi Home Bookstore, which opened in August of 2018. This is the base of operations for the “Say Hi Home” workshop. Most of the members of Say Hi Home, founded by Liu Yuyu and Lin Hsiu Peng, were born in the 1970s and 1980s. 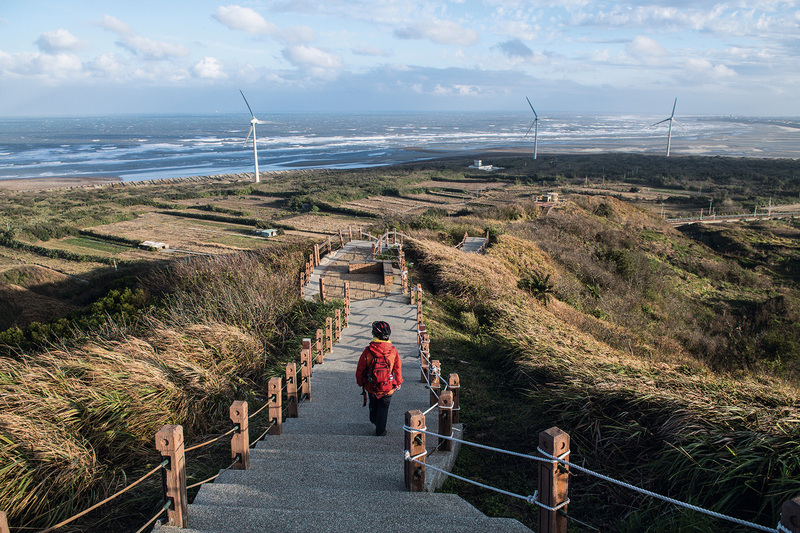 Liu and Lin met through the anti-­wind-­turbine movement launched by the people of ­Yuanli. After participating in various social movements they reflected on their ex­peri­ence and concluded, “If social movements want to get results in the future, protesting is just a temporary phase. If you want to make society change in a positive direction, you have to return to the land.” They put this into practice themselves by returning to their hometown. 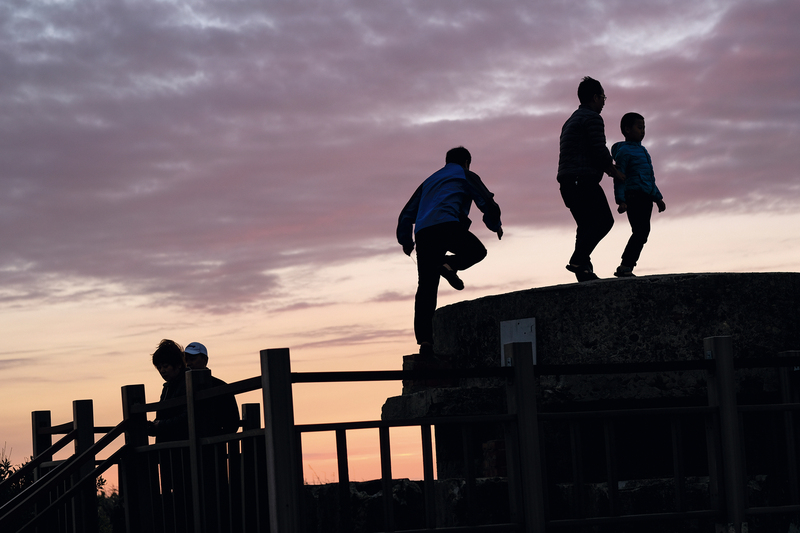 The first step for Say Hi Home was to reconnect with the land, and this was the beginning of getting to know ­Yuanli anew. 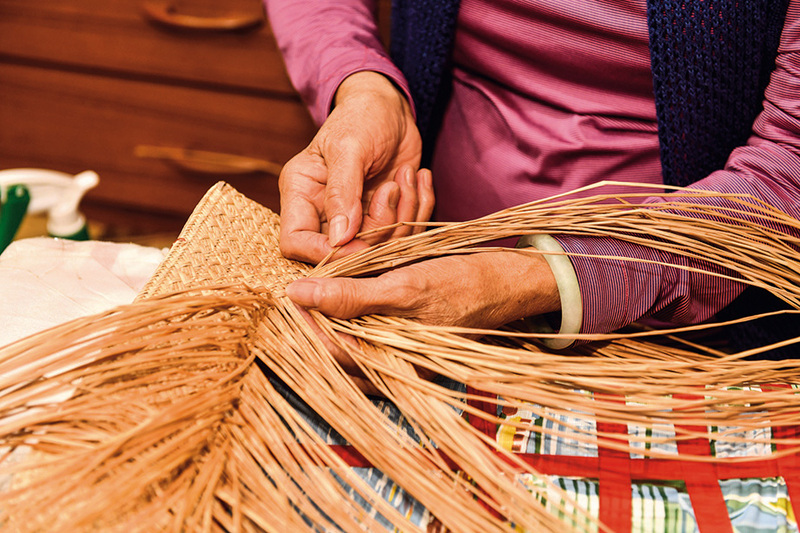 They traipsed through streets large and small doing field surveys, helped eco-friendly farmers to resolve labor shortages and find sales channels, and also tried to revive the rush weaving industry that once flourished in ­Yuanli. 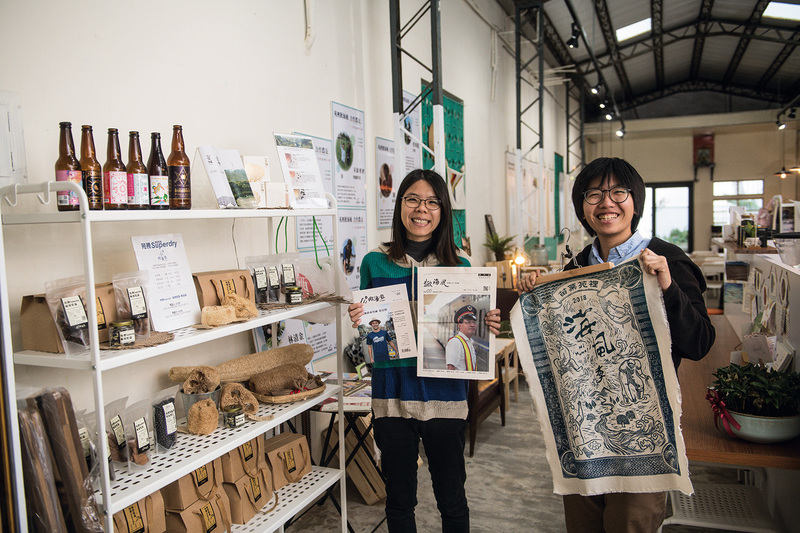 In 2015, the Say Hi Home team transformed the information gleaned from their field surveys into mini-tours for vis­itors, guiding people through historic Tian­xia Street, to see the 120-year-old market, or to visit the former residence of Kuo Chih-yuan, a pioneer of Taiwanese folk music. In 2016, Say Hi Home launched a pub­lica­­tion to report on local news and collect cultural memories from the area. In 2017 they held the “Hi Home Festival,” with “say hi to everyone” as the core spirit of the event. They erected a stage across from the Mazu Temple, which was a very bustling place in days gone by, and put on a “mother tongue concert” in hopes of rediscovering that local hustle and bustle and of attracting young people who had left ­Yuanli to return home and see how different ­Yuanli could be. “After promoting these activities for a long time, we felt we had to put the focus back on local young people. The root of culture is in fact ‘education.’ If people don’t have enough understanding of themselves, they will lack self-confidence. This self-­confidence comes not only from knowledge of the locality but also from knowing yourself, so reading is very important.” This is how Lin Hsiu Peng explains what prompted them to open Hi Home Bookstore in an era when large numbers of bookstores are going out of business. Hi Home Bookstore is a place where children are welcome to read. Elderly people living nearby were also happy when the store opened, its lights at night conveying a sense of companionship. As the bookstore ­quietly plants a seed for the locality and for the children, we hope that the founders will not be daunted by the buffeting winds of the environ­ment and will continue to press onward. In the past the coastal area along the rail line was considered poor and disadvantaged, lacking both economic capital and cultural resources. But on one bicycle trip, hearing the story of Say Hi Home—how a group of young people who had returned to their rural home underwent a transformation from passivity to actively initiating a tide of change—gave us the energy to press ahead.